A grey drizzly New Year's Day in Warwickshire, England. 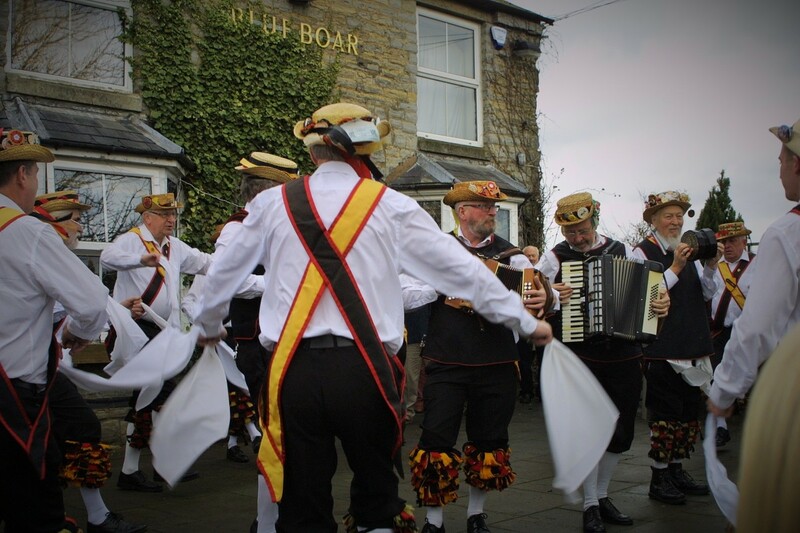 I had arrived at the Blue Boar just short of noon to meet the Shakespeare Morris side, and their side project, the Shakespeare Mummers. Mumming is a tradition that has been recorded since 1779 in a document entitled "Morrice Dancers", but is believed to pre-date that by centuries. Mostly taking place during the period around Christmas, a group of performers would disguise themselves and perform a play in exchange for money, ale, or food. These men would usually be locals, who out of work during winter, would visit the farms and abodes of wealthy folk, and perform their play in the kitchen. Servants and lords alike would gather to see the plays, which were a great form of entertainment. Food and ale there would be today, at the inn. Located in Temple Grafton, the Blue Boar is hundreds of years old, with the earliest part of the building dating from the early 17th Century. Its stone walls, wooden beams, flagged floor, and welcoming open fireplaces make it a cozy and rustic place to drop by for a pint or a bite to eat. 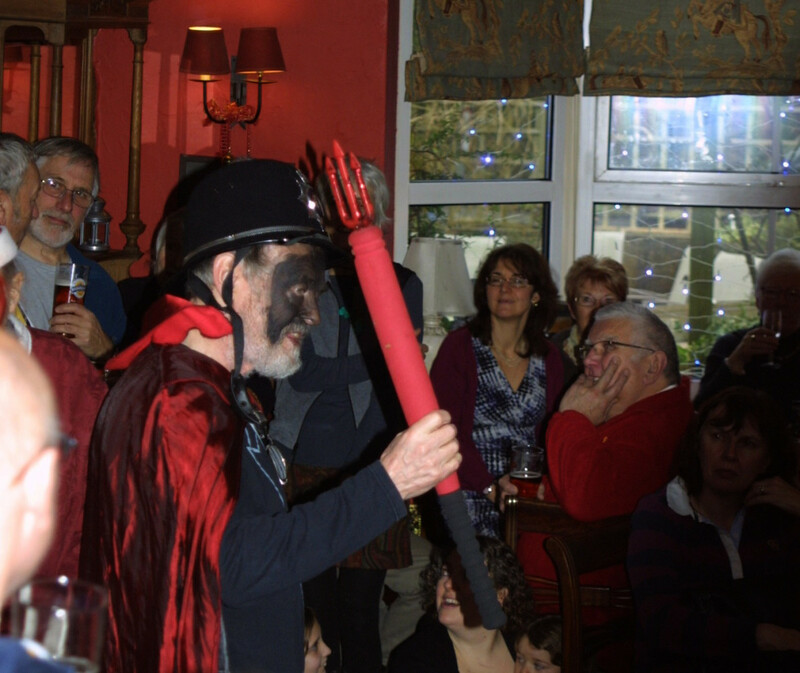 The history of the inn made it the perfect venue for a traditional British event on New Year's Day. 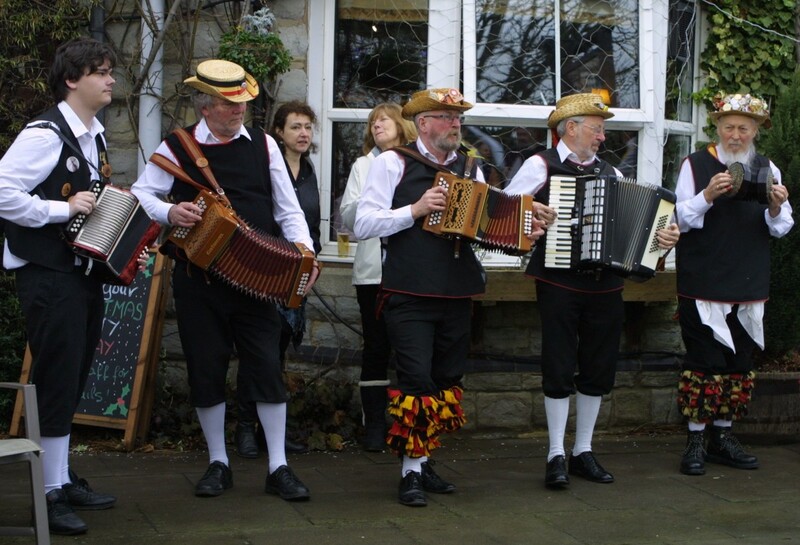 Mummers would be performing their New Year's Day play, but the first event was some lively midday Morris dancing in the beer garden. The rain held off, allowing a full set of dancing by the Shakespeare Morris side, who perform dances in the Cotswold Tradition. Bells jingled in time to footsteps, providing the percussion to the merry music that accompanied the dancers. 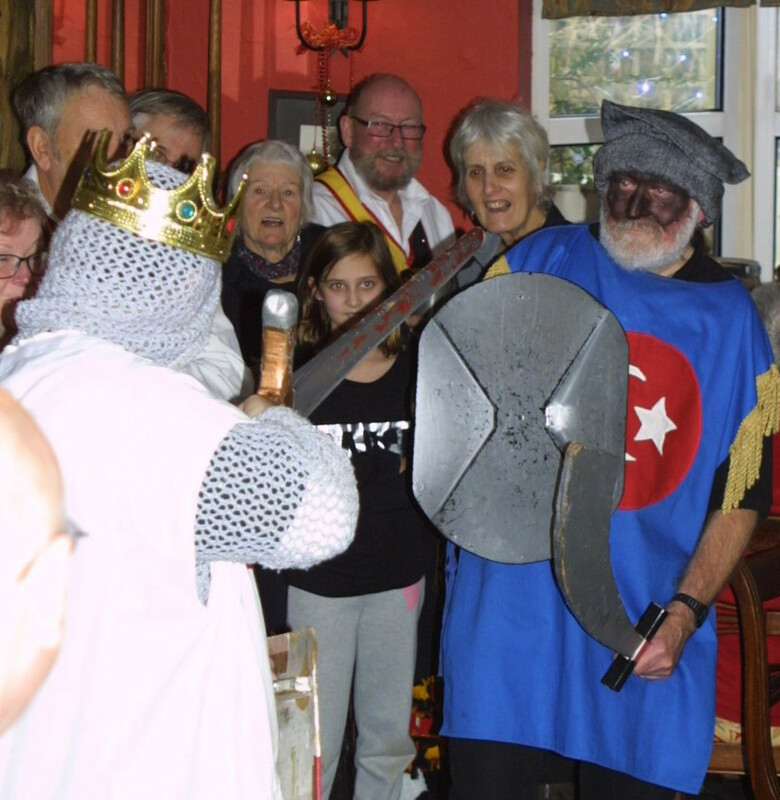 At the end of the set, the group gathered for a group photograph, and then all retired to the inn whilst the performers got ready for the play. 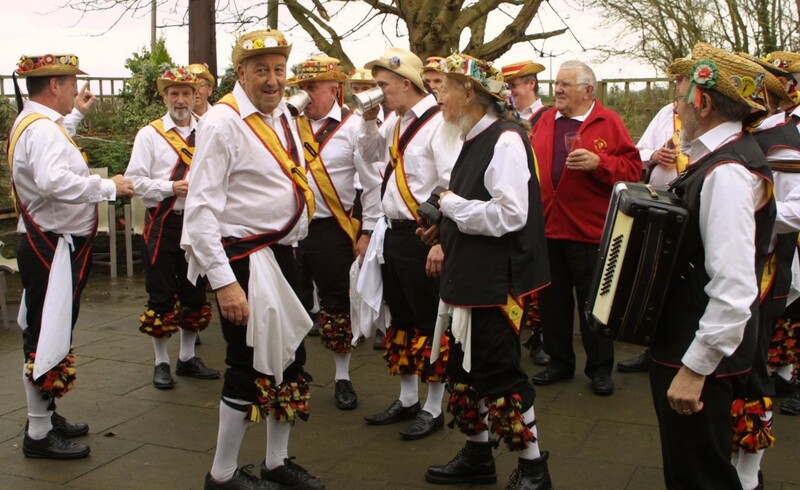 New Year's Day is the date of the annual party for the Morris side. 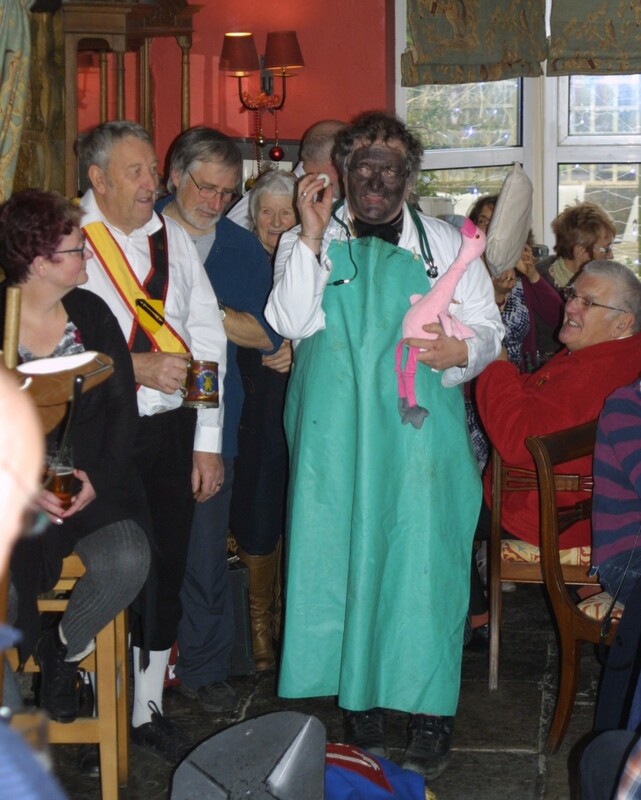 Besides the dancing and mumming, folk singers and musicians attended, filling the Blue Boar with jolly and sometimes haunting music. 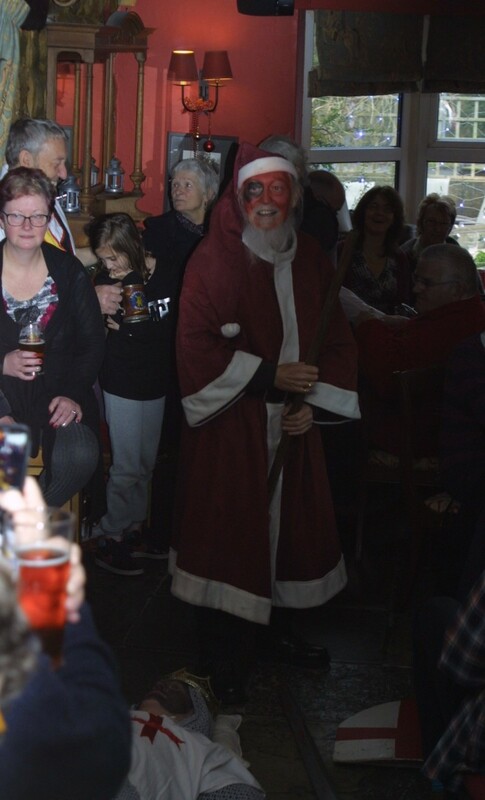 Whilst most Brits sat at home nursing their hangovers in front of the telly, a vortex of good cheer and traditional merrymaking was being whipped up at the inn. 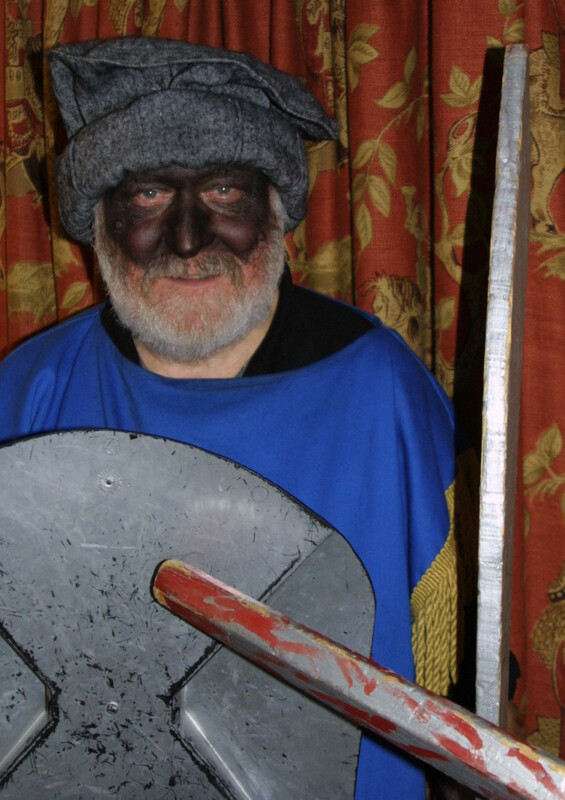 I spoke with Alan Whitbread, who is Captain of the Shakespeare Mummers. His chief interest is singing and sea shanties, of which he has earned international renown; performing all over the world including the USA, Australia, and even Inner Mongolia! Playing the part of Father Christmas, he will be narrating the play. "New Year’s Day performances have occurred for 15 to 20 years, since we’ve started having a New Year’s Day party. You’ll see the Bidford play, we’ll always do that on Twelfth Night in Bidford." 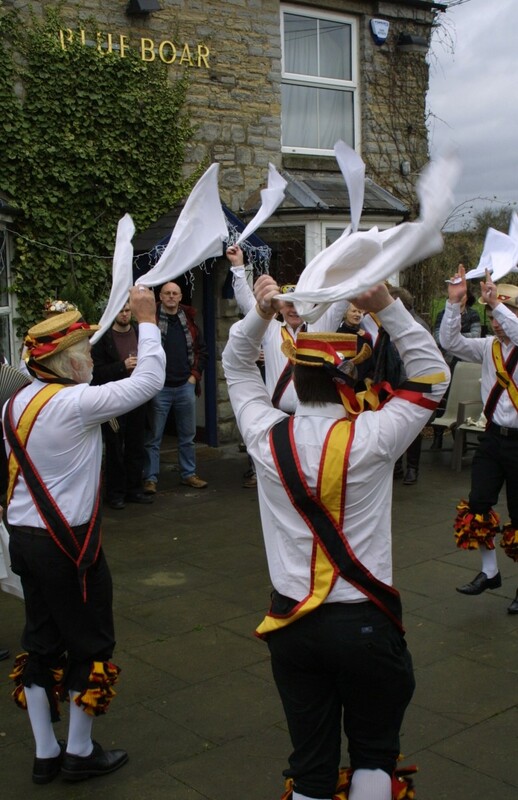 The Shakespeare Morris are the keepers of the Bidford Morris tradition, so the village on the banks of the River Avon always holds special relevance to the dancers and mummers. 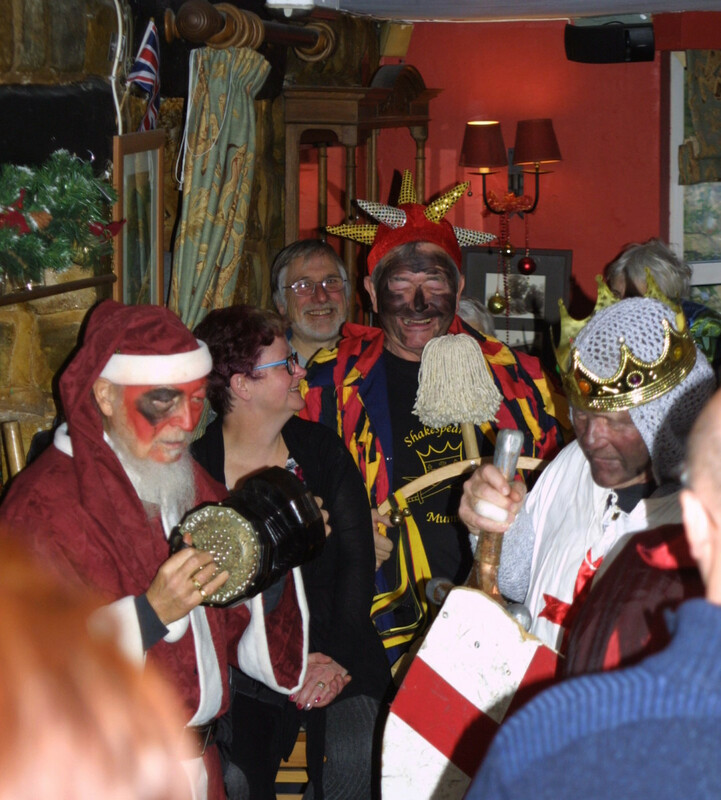 Whilst mumming is a Christmas tradition, there are also some other instances throughout the year when the mummers will perform. "We perform about ten times in the Christmas period, which is from the last Friday in November to the Twelfth Night. We normally perform three plays per evening over ten evenings. It’s quite a lot actually. It’s always different men, you don’t get the same men consistently in each part. Then we do a St. George’s Play on St. George’s Day (23rd April) with St George and the Dragon, so we’ve written a part for the dragon. I don’t believe there are any traditional mummers' plays which have dragons. So if you see one, it’s because it has been written in. Just to be different we’ve got a dragon with two heads. So it’s a Siamese Dragon, so it’s got three legs and two heads. And that’s really silly because they can’t get up off the floor. Once they’re dead, “Come on you get up now”, and they just can’t get up off the floor and will fall back over or something. That’s ‘cause it’s difficult with the three legs. And that’s always good for audience. They love that." 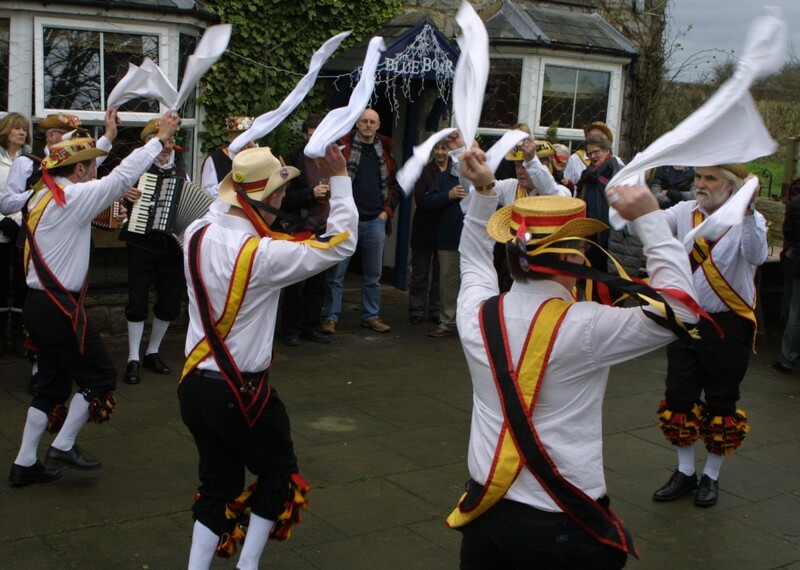 The mummers also perform at Snowshill, a picturesque village in the Cotswolds, just over the border in Gloucestershire. "On the 11th June each year, it's St. Barnabas' Day. 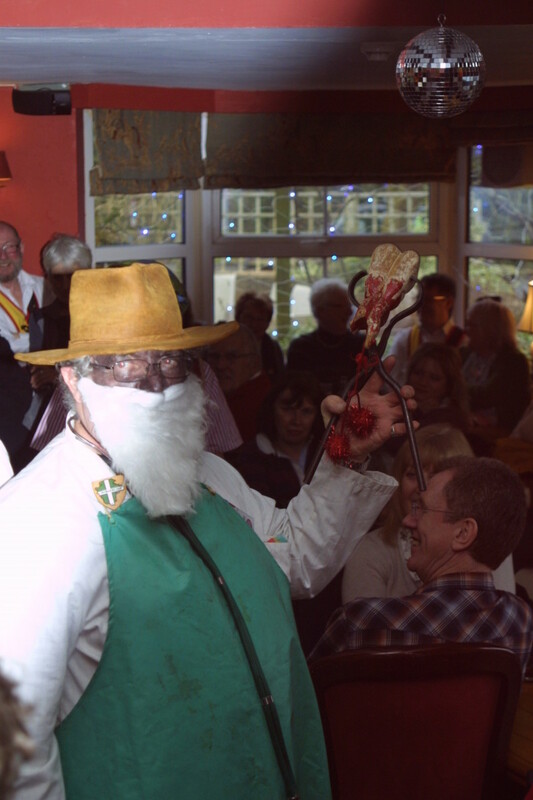 We always do a play on St. Barnabas' Day because that’s when the Snowshill Mummers did it. There’s a picture in the Snowshill Arms down the far end of the village the Snowshill Mummers in 1931 or whatever the date was, and they used to perform it at the church fête. The church fête was on St. Barnabas' day 'cause it was St. Barnabas' church. And we've performed in the Snowshill Manor this year as well which was good." The apple harvest has always been an important part of the rural calendar around much of Britain, with festivals taking place in late September and early October. 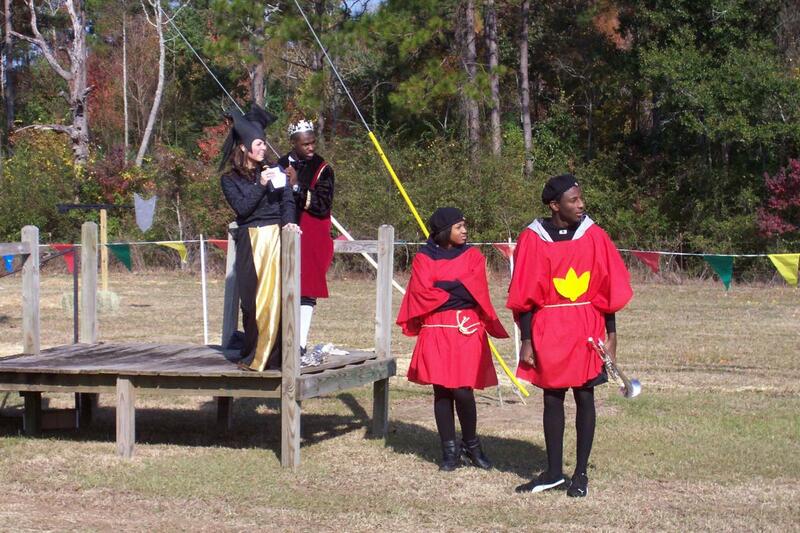 The mummers perform a play to celebrate this bounty and add something to the apple fairs. "In the Autumn we've got a play that was written by the guy from the West Country which is an Apple Day play. I spent days and days and days adding jokes in and cutting out things, as it was very boring. It’s about a third of the length now, and have made it our play. So instead of having King George or whatever, you have apples playing parts. So they dress up in red or green and are fighting things, and it’s all about the apples being from the European Community and all the world, and what about our British apples and English apples? So that’s what that’s all about. And one of our men wrote a parody of Jerusalem and he’s only changed about half the words. It starts off with, “And did those teeth in ancient times, bite upon England’s apples green. And was the Bramley apple core…" and it goes on like that. So we do that play in the Autumn. We perform more or less around the year. Not so much in the Summer." 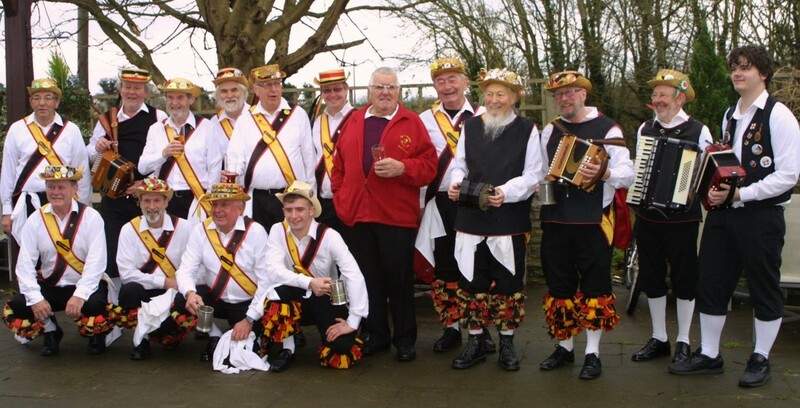 The Shakespeare side has had a mumming group for at least 50 years, with its activity increasing in the last 25 years when Alan took the role of Captain. He made efforts to expand the repertoire by researching plays from the Stratford area, and villages to the south. He went to the National Archives owned by Ron Shuttleworth, in Coventry. Whilst some plays were recorded in full, Alan had to reconstruct others from snippets that remained. Plays from Bidford, Bickmarsh, Bretforton, Salford Priors, Snowshill, Little Compton, Dumbleton, and other villages were preserved and saved, and brought back to life. The mummers cycle the plays, so the same play is not repeated each Christmas. The plays are meant to amuse, and contain plenty of lewd comedy and satire. 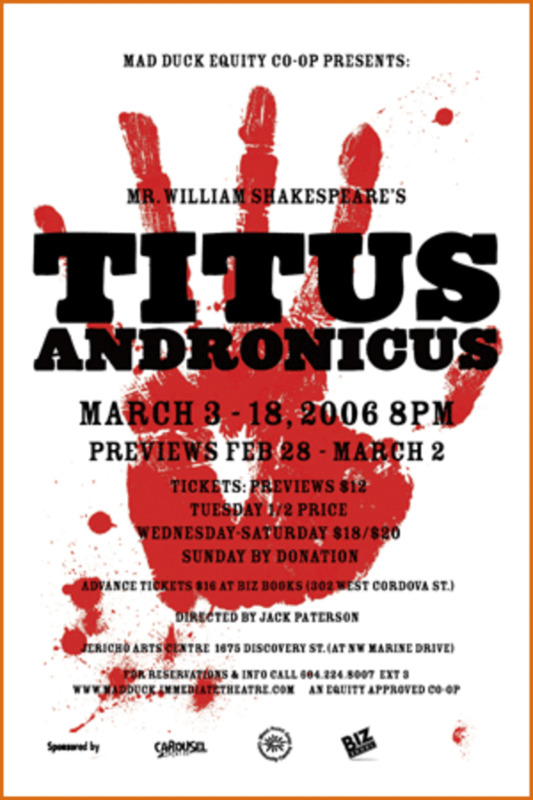 Audience participation is important to the performance, and jeers and shouts are to be expected during the play. "We get quite a lot of interaction from the audience as we do the performance. I mean for instance, today Jack was putting King George’s leg up and down as he was on the floor, so I said “You got any water coming out of his mouth yet?” I mean, it’s not a very good joke, but it was a joke. And we’ve never done that joke before. So every time we perform, there’s something different, from somebody or some people. We don’t write those in all the time, or else all it would be is silly jokes. We add our own words to it. Mummers was always developed, it was never written down. The only time it was written down was when it was collected. You’d get different men coming into the village each year or somebody dying or whatever, so they’d cut his part out, someone else would come in and they’d add a part. Somebody would see a play down the road and think “Oh I like that part, I’ll do that”, and they’ll add a part to it. It wasn't perfect memory so words changed, and everything changed. It was a fluid situation. So we do a bit of that, so I put the virgin cure in to all our plays, that’s our invention. Then we add other words and things so there’s some modern expression some times. We’ve got one part which is somebody comes in with a dog, and we’ve written it in so we say “That’s a very pretty dog, what sort of breed’s that?” “It’s an American Poodle.” “An American Poodle, what do you mean, American Poodle? What’s its name?” “Blair!” So we all kick the dog then. We don’t do that now, because Blair’s not in, but that’s the sort of thing we do. It’s an added thing to it." Alan described an occurrence that appears in all accounts of folklore; from songs to mythology. That is that a tale will be different depending on who tells it. "We’ve got two plays from Broadway. The first was collected in about 1870-1880, the second one was collected in 1910 from the American Folk Journal. The daughter of the Vicar emigrated or something, and she was over there and she remembered the play because she’d seen it when she was young. She published it in the American Folk Journal so it was written down. But they’re so different! Twenty years apart, there’re ten parts in one play, seven in another, and you get these (the characters) all, including the two women. You've got them lined up on the floor, all these dead people. And that’s quite fun. But my point is, it’s the same village, different times, different play. 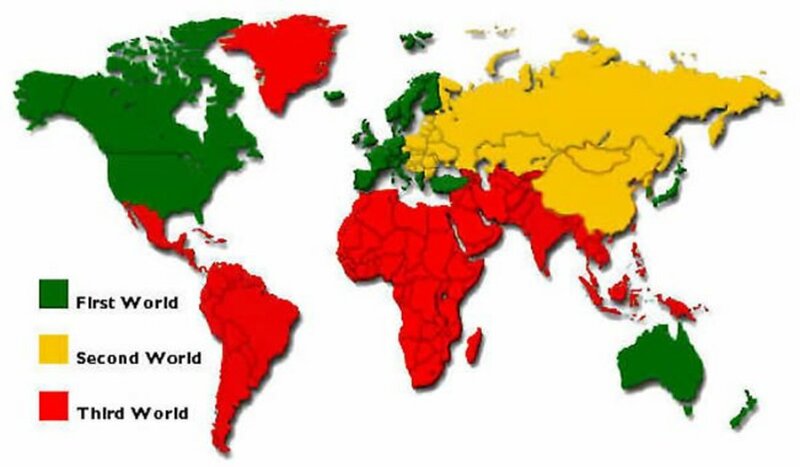 Similarities but not the same. This is why I never worry about changing a play or updating it. I’ll just put a part from this play and put it in that play. That’s what would happen. It’s in the keeping of the tradition to do that. Not to preserve it word by word as it was." Whilst there are clearly historical references in the plays, the performances certainly do contain humour that is relevant to the modern audience. And so the time came for the play to begin. 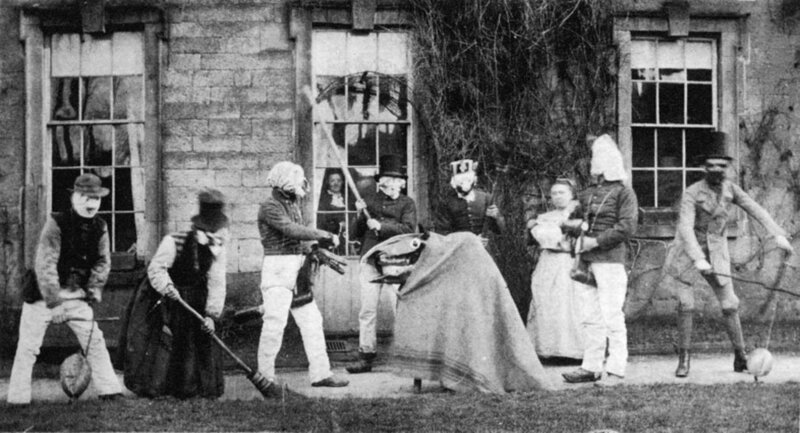 Mummers in costume huddled on the edge of the inn's lounge whilst Father Christmas introduced the story, and the tradition of mumming. 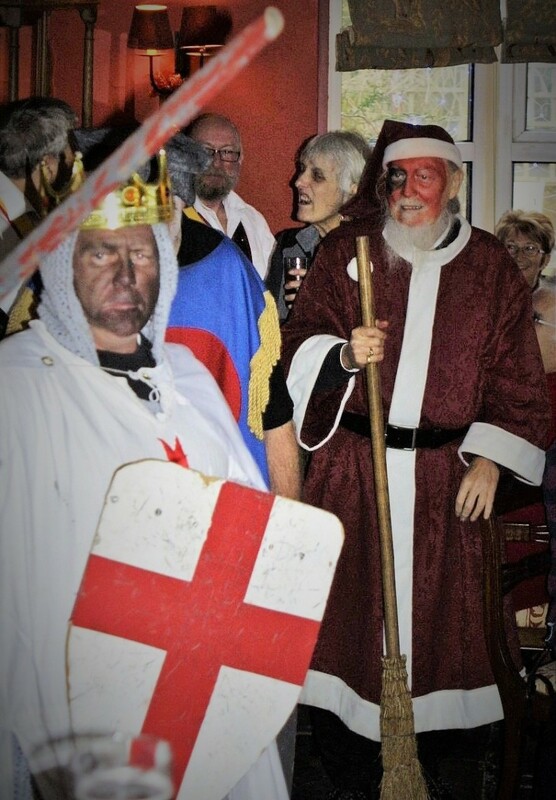 This play featured a Fool, a Hero (King George), a villain (the Turkish Knight, although this swaps with Kaiser Bill or the Prussian King), a quack Doctor and his assistant Jack Finney, and the narrator, Father Christmas. The theme of the play was one of resurrection. 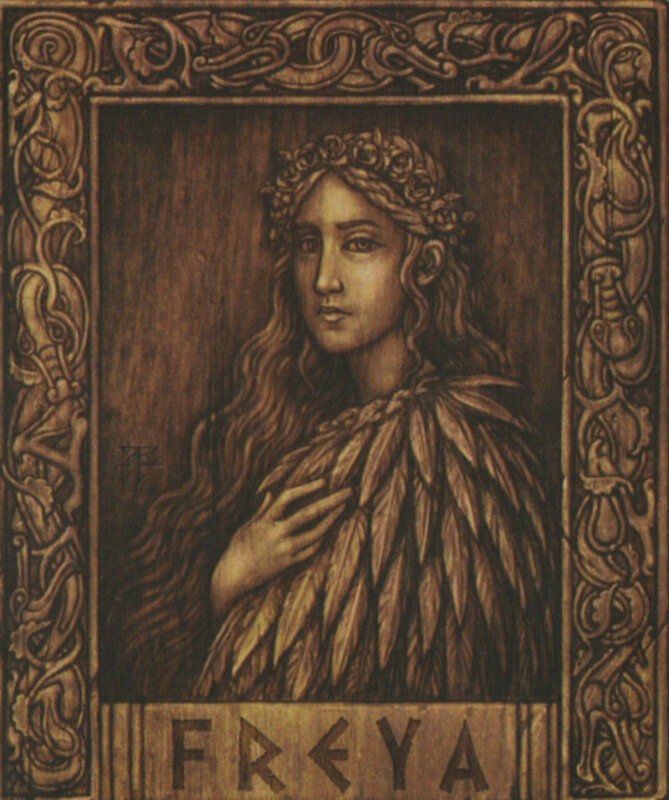 With the sun "reborn" following the winter solstice, and also the story of the birth of Christ at Christmas, the symbolism of life, death, and rebirth is an important one during midwinter, acted out by characters in the play. 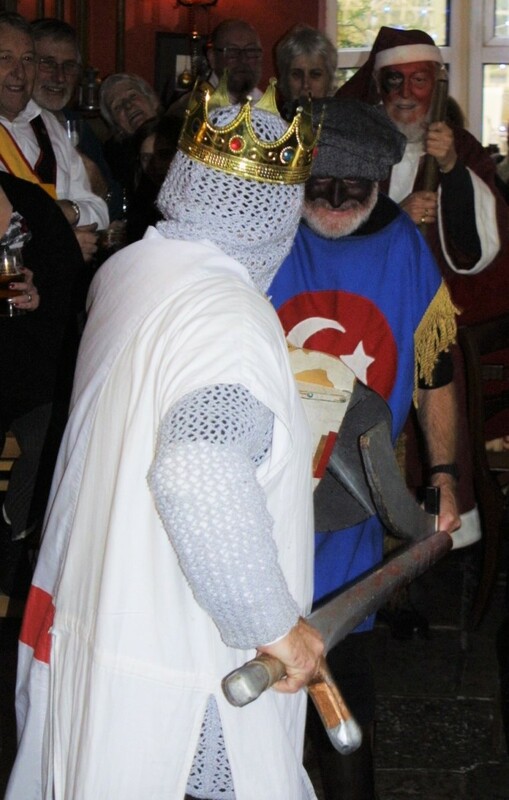 The Turkish Knight and King George battled each other, until the Knight was slain. Out came the doctor with his miraculous medicine, who was able to bring the Knight back to life. More sword fighting ensued, and it was the Turk's turn for vengeance. With a swipe of his scimitar, King George was killed stone dead! The Doctor appeared once more, but found he needed his assistant Jack to aid him. Out came Jack Finney with the Doctor's bag, and after investigation, it turned out that the King had a wolf's tooth stuck in his head. The only way to remove it was with a large pair of pliers, from the king's rear end! 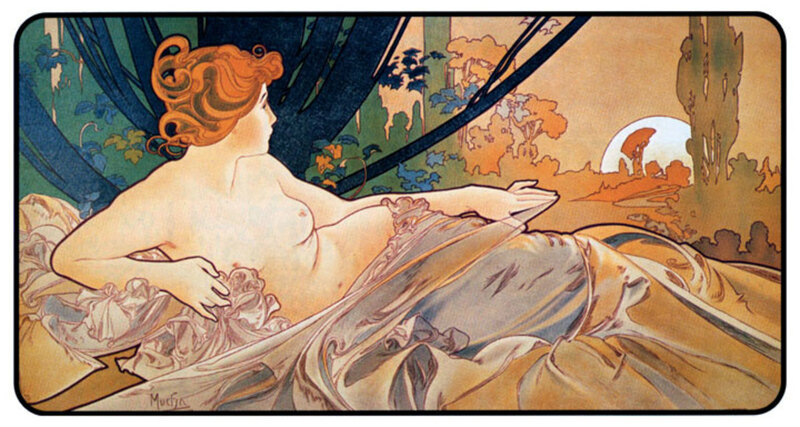 The King then seemed to recover as the audience cheered, but then swooned once more and lay dead on the flagstones. 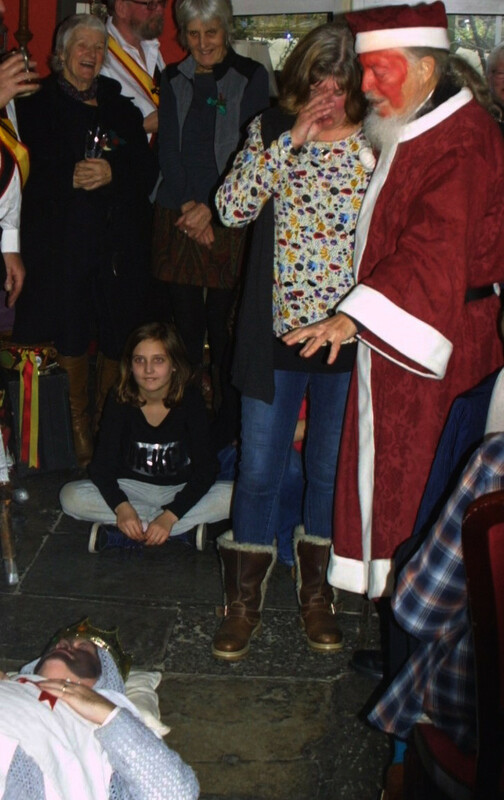 Only a miracle would save him, so a virgin was plucked from the audience by Father Christmas, much to the lady's embarrassment! With a kiss, the King soon bounded up back to life. The play was filled with satire, comedy, songs, and metaphor, and featured monologues and folk stories about local events and superstitions. Magpies, the devil, ill omens, and stories of consequences would appear throughout the play with little snippets of wisdom for the audience to take home with them. At the end of the play, the mummers burst in to song and dance, with the audience joining in. A frying pan was passed around the crowd for donations, as in keeping with the tradition during years gone. Whilst the funds raised today would go towards the expenses of the group, in times past they would have helped feed a family until the farms had need of labourers once winter was over. It was a merry and lively experience, and such an event must have brought great Yuletide cheer when the mummers came to perform in the kitchens of those great houses. 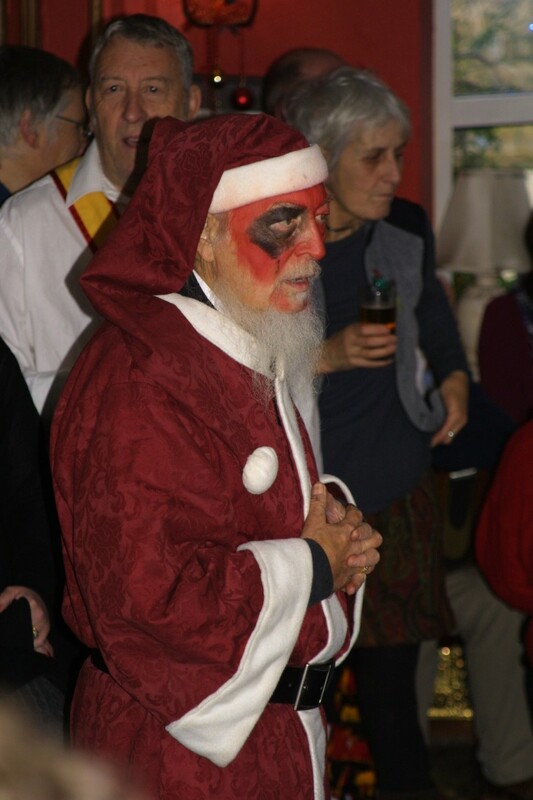 I frequently see comments when images of mummers are presented, accusing them of being racist because of the black face-paint that they wear. 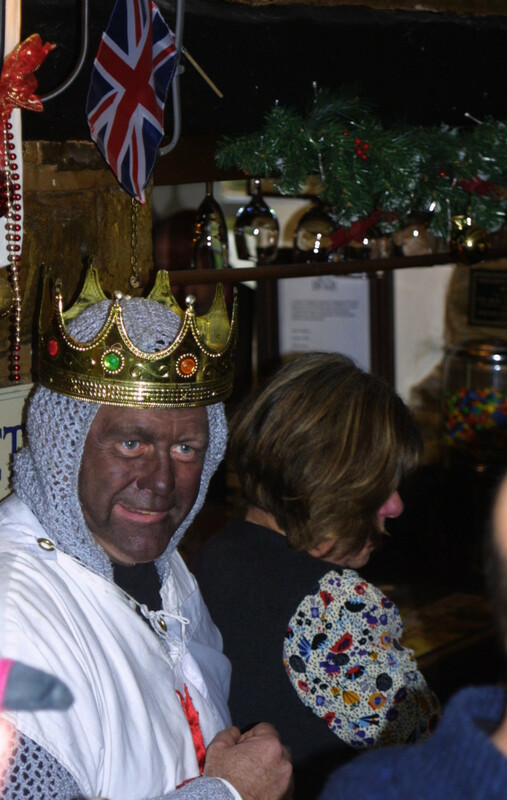 The act of painting one's face black to take part in a mummer's play has nothing to do with racism, and is not done to intimidate or make fun of people of African descent. 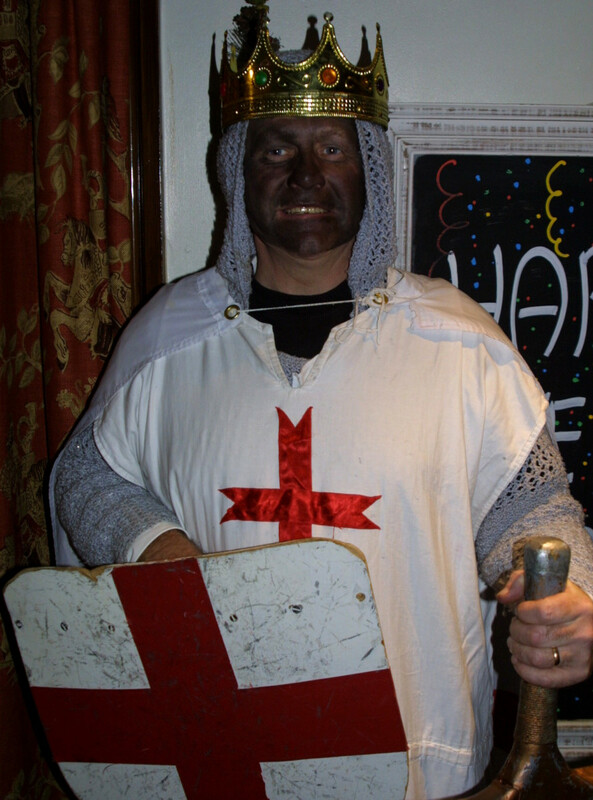 It has no associations with "blackface" or minstrel shows, popular in the USA in the 19th Century onwards. 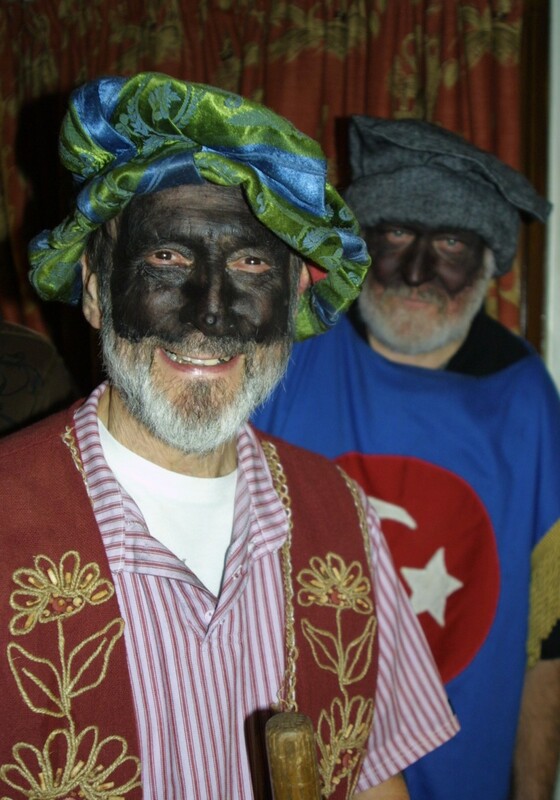 Mummers paint their faces black or disguise them with masks as a traditional part of their ritual costumes. It was done originally so that they would not be recognised. These would be men that worked for the local land-owner, who would not wish to give their identity away when performing for food in the middle of the winter. If things got rowdy, they had their disguise. And in the dull light of wintertime, their dignity remained intact when visiting houses in the hopes that rations would be doled out to help them through the lean months. When a mummer paints their face, they lose their own identity and become the character which their costume portrays. Details of Alan Whitbread's work can be found on his website. 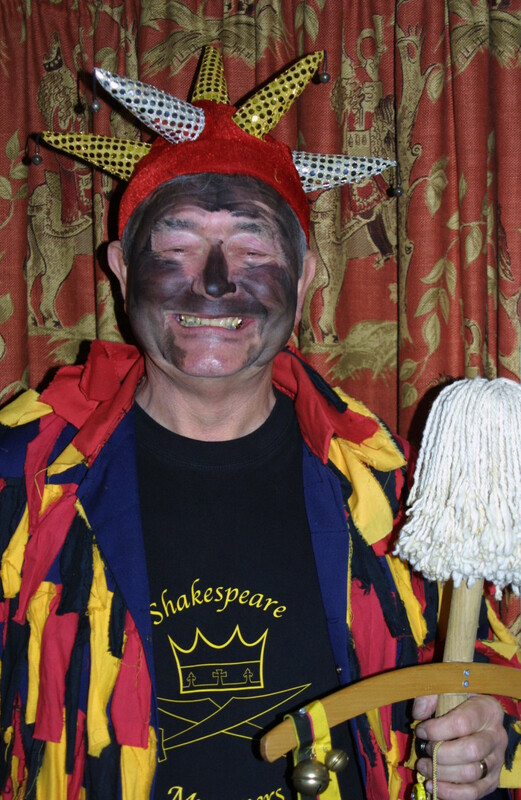 To learn more about Morris Dancing and the Shakespeare Morris Side, please refer to the article; An Interview with a Morris Man. 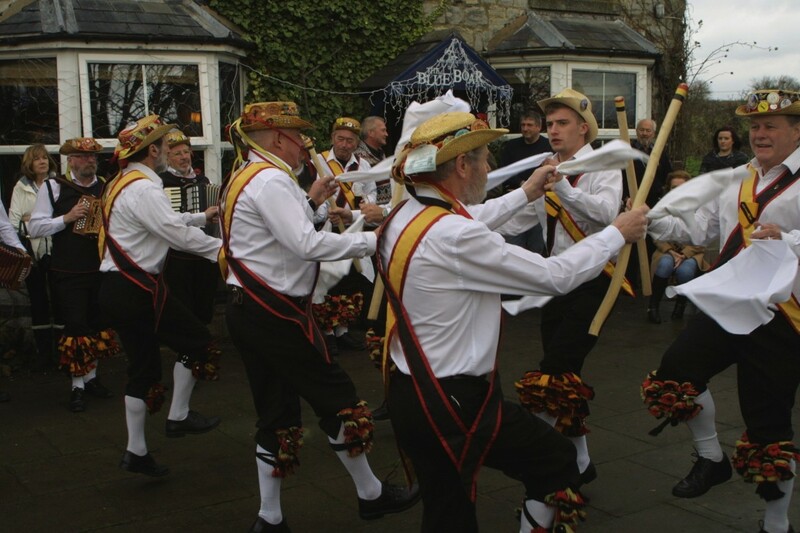 If you are interested in Morris Dancing or Mumming, it is worth looking up The Morris Ring's website. Thank you, Brian! Much appreciated. Another really interesting hub Polly- voted up! Yes, it is stepping into a role to become something else for the duration of the play. The face paint is just a part of the traditional costume. People never weary of stepping outside of themselves to do and say things they ordinarily would never do or say. I guess it's part of the human condition. I suppose when we read books or watch movies we are doing that vicariously. The face paint looks so odd first because it is odd and second it would not disguise a person from someone who actually knew him. I think it may be part of the wink wink, nudge nudge shared "delusion" that people willingly take part of. These are traditional throughout the whole of the Christmas season, peachpurple. It's the old tale of good vs. evil, of rebirth over death. And they're good fun to witness too, lots of audience participation! Hi Jodah, the blackened faces are always queried, so I've included a paragraph right at the end of the article about why they do this and what it means. An interesting tradition Pollyanna. 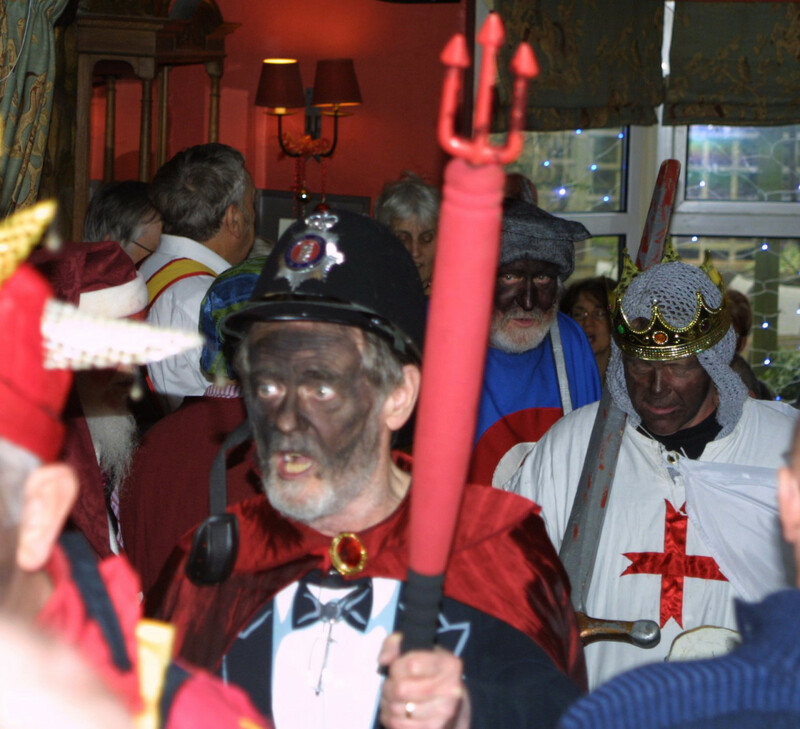 I have never heard of mumming before, what's with the blackened face? I don't know if you mentioned that. Thanks for sharing.